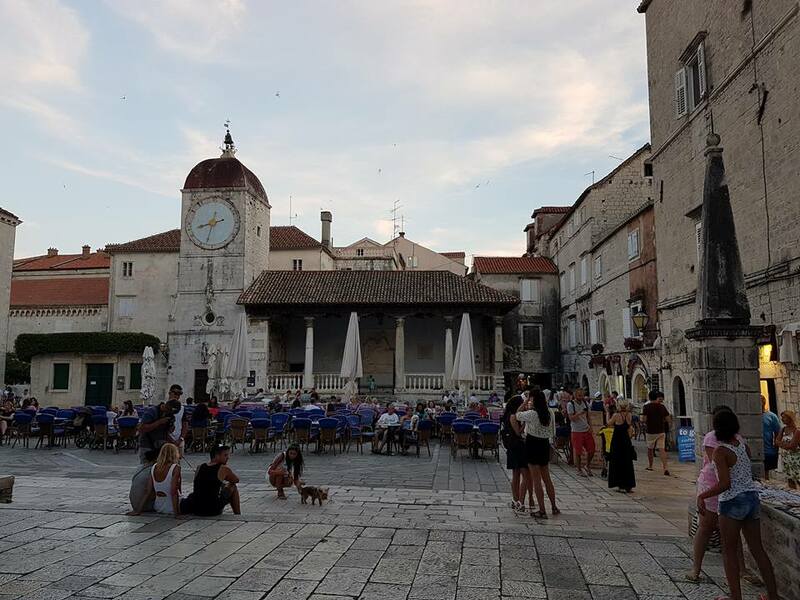 Trogir is not generally regarded as one of Croatia’s top gourmet destinations, but there is one exception in the heart of the UNESCO World Heritage Site of its old town. TCN reports on July 9, 2017. There used to be an ongoing joke about long-term foreign residents of Dalmatia regarding the region’s restaurant menus. There was one factory which produced the menus for all the restaurants in Dalmatia, and all the restaurant was required to do was to write in the name of the restaurant and the prices, for all the menus were essentially the same. I remember finding the food in local restaurants wonderful when I first moved to Croatia 15 years ago, but it did not take long to get a little bored of the lack of variety. How times change! 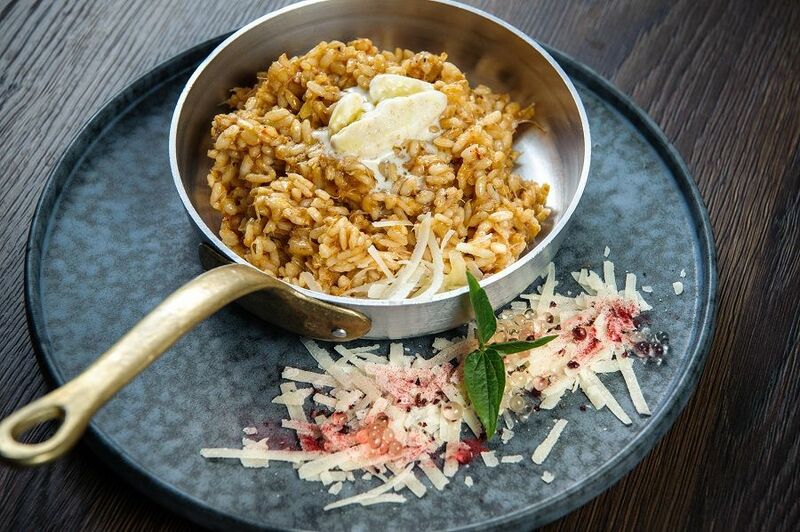 Not only has there been a marked increase in international cuisine options, but there has been a lot more creativity within the Dalmatian menu itself, with innovative uses of the rich variety of local ingredients leading to some very unique dishes. But still, those buzzwords of ‘authentic’, ‘traditional’ and ‘local ingredients’ were all pervasive. I had been hearing about a restaurant in Trogir which was doing things a little differently, and I was delighted to accept a recent invitation to come for lunch at Don Dino, a luxury restaurant in the historic Trogir old town and UNESCO World Heritage Site. 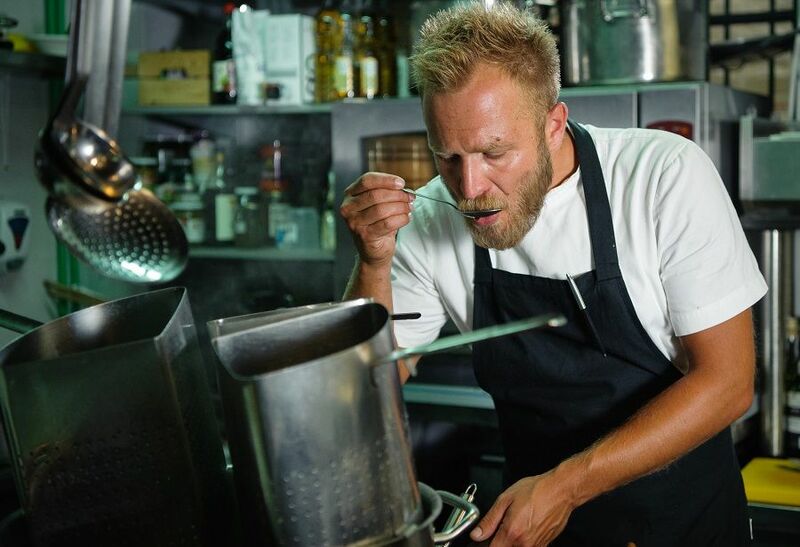 Trogir is not particularly known for its fine cuisine, and so I was especially interested to visit, as the resident chef was one of Croatia’s brightest talents, as well as a celebrity chef on national television. 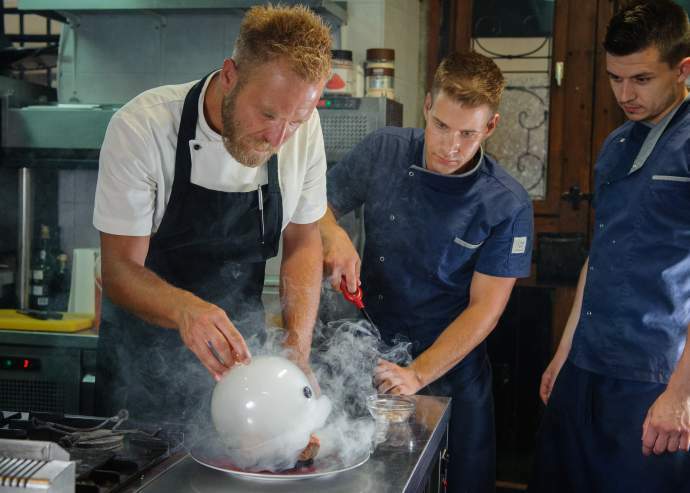 I had first met Ivan Pazanin several years ago, when he was working as a sous-chef at upmarket Restaurant Passarola in Hvar Town, and it is fair to say that Ivan’s career has accelerated rather quicker than mine since then, and he is certainly a chef in demand. Not a man who frequents fine dining restaurants very often, I was stressing about my wardrobe and what to wear until I was informed to dress casually as one would do for a normal meal in a restaurant in the summer. 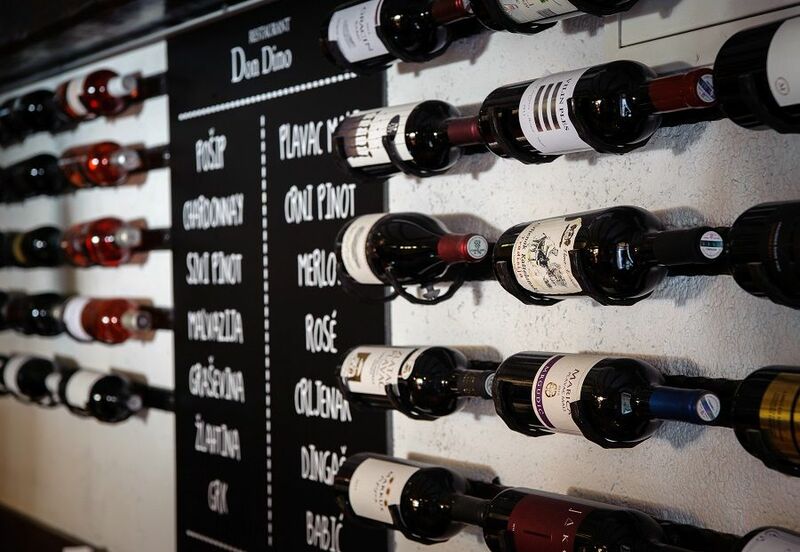 For Don Dino offered something a little different – all the class of a fine dining experience in terms of food and service, but with the relaxed approach which made one feel at home. As we drove from Split, it occurred to me that this was only my second visit to Trogir in all my fifteen years to Croatia. I had perhaps been put off by my last visit over a decade ago, when I came to buy a bargain property – a two-bedroom stone house in the heart of the old town for just 60,000 euro. The catch, as I learned only after viewing the house on-site, was that the house actually had three bedrooms, and the third one was not for sale; the owner wanted to keep that for himself, with access through my house, of course. But as we drove along the road past Split Airport, a road which has FINALLY been completed, thereby making Trogir accessible in less than 30 minutes from Split, my sense of expectation rose. I had been in the crowds of Split and Dubrovnik in previous days, and I was curious to compare with tiny Trogir, with one of Croatia’s top chefs hidden away in the kitchen cooking up a feast. Don Dino is ideally located close to the entrance to the old town, a short walk from the car park and over the canal. Its spacious outside space dominates the square in which it is housed, while its intimate interior has a cosy feel. The owners and waiter greeted us warmly, and we were ushered to a table on the terrace. I felt immediately at home. Pazanin himself came out to greet us, but only briefly, as his Ivan Pazanin Tasting Menu was proving very popular, and he was needed in the kitchen to deal with the demand. So what to order? Rather than pore over the appetising menu, we decided to let the waiter impress us with his suggestions. Local ingredients, tradition, authenticity. My mind went back to how every Dalmatian meal started back in the old days – without fail. Dalmatian prosciutto, Pag cheese and olives. What would the affluent Don Dino serve up to begin proceedings? The answer was rather humble, surprising and delicious. Soparnik, a true Dalmatian peasant food which these days is culturally protected, but back in the day, it was the only food many locals could afford. A savoury pie with blitva (Swiss chard) as its key ingredient, a favourite of the once independent Poljicka Republic in inland Dalmatia. For local ingredients, tradition and authenticity, as well as the element of surprise, it was an encouraging start. 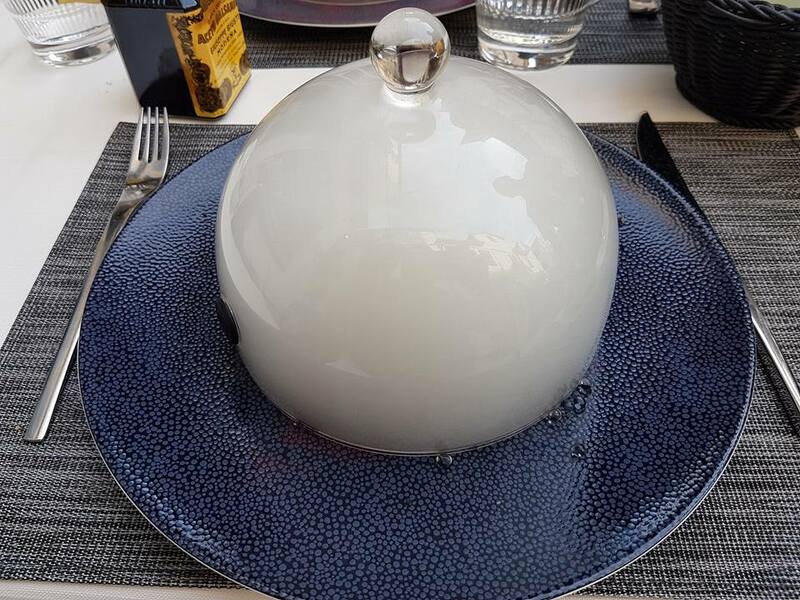 It was the little things that fascinated me at the restaurant, such as this rather intriguing side dish which came out with the starter. 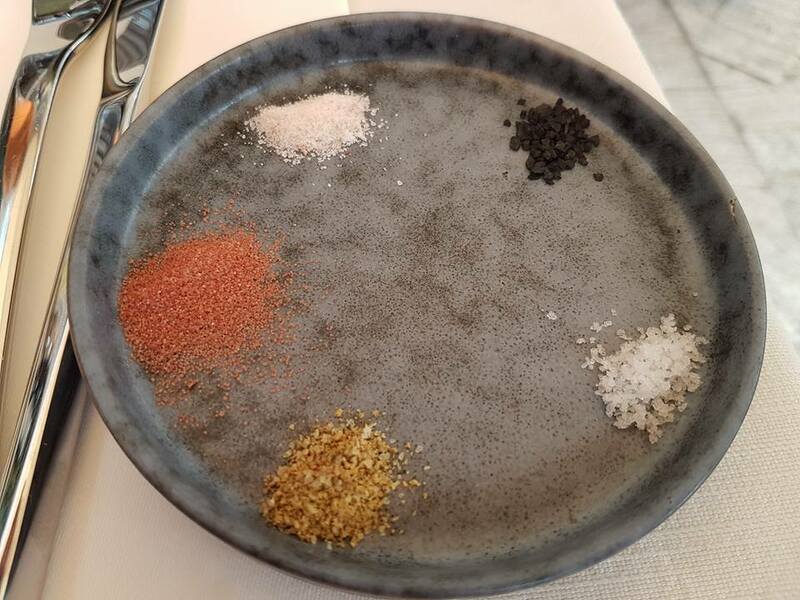 Five types of flavoured salt, from four corners of the planet – Hawaii, the Himalayas, Norway and the Adriatic. A wonderful little addition to try with the excellent local olive oil and fresh bread. The fresh fruits of the sea, as we edged into a fish and seafood extravaganza which is with me still, some three weeks later. 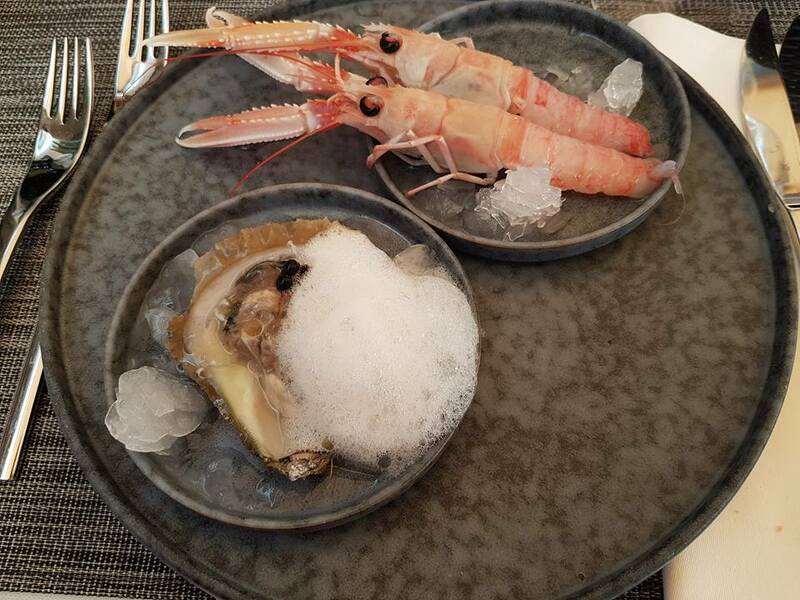 Raw shrimp and oysters in a fluffy lemon foam. 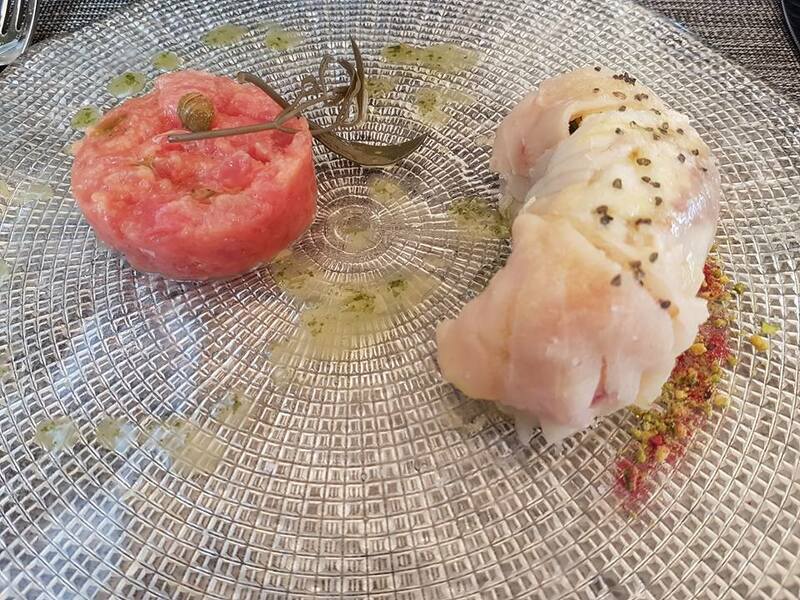 Tuna tartare and sea bass carpaccio – five stars. 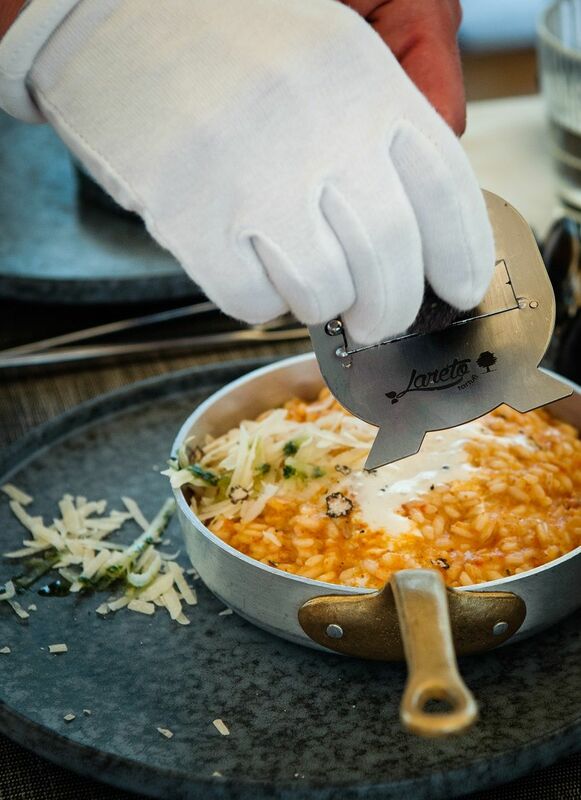 This was followed by what was certainly the most innovative dish of the day, described on the menu as sea urchin and crab risotto with homemade ice cream with caviar. The Dalmatian menu factory a decade ago had certainly never come across anything like this. The presentation of the food, as one would expect from such an experienced chef, was immaculate, but there was also a sense of theatre. This was turning into an entertainment show, as well as a lesson in the art of fine Dalmatian cuisine. Our attentive waiter suggested that I might want to video my plate, as he lifted away the bowl. What could possibly be underneath? 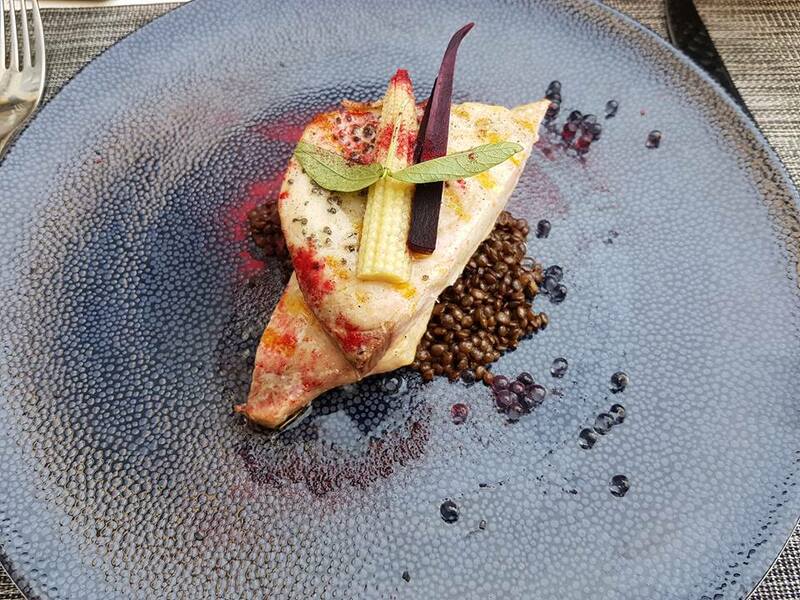 Smoked swordfish fillet on a bed of beluga lentils with orange and honey emulsion. It was divine. Throughout our meal, I became mildly fascinated by the owner of the restaurant, who expertly kept an eye not only on each dish as it came out, but on the way the restaurant was running, but in a very relaxed manner. He had no need to worry, for the staff clearly had been well trained, knew their jobs and delivered the food and drinks with friendly efficiency. One of the things I am often told about local restaurants is how much attention owners pay to local ingredients, endeavouring to find the best fresh supply of foodstuffs to serve their guests. I had heard how he would often travel considerable distances to get the best local prosciutto or a new wine, a wine which was not necessarily known. 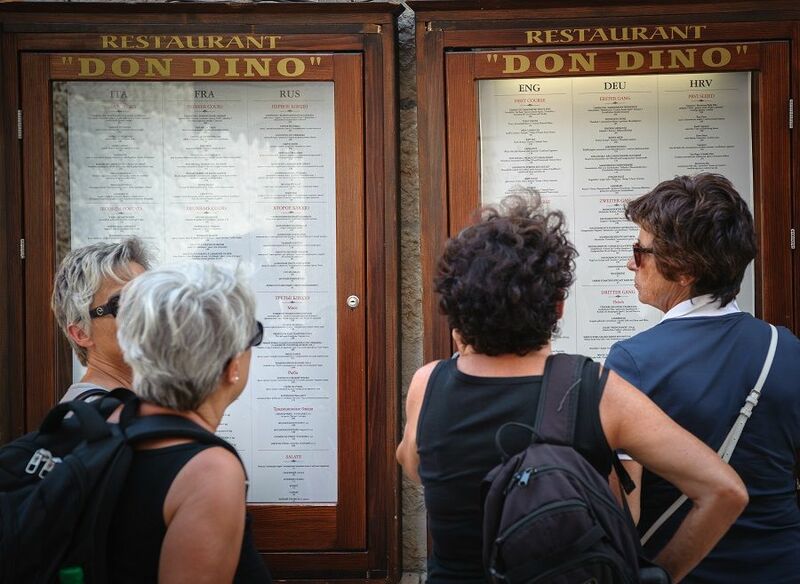 Don Dino certainly had the feeling of a restaurant which was genuine in its offer, and where exciting culinary journeys could be undertaken with every visit. The owner was immaculately dressed, as one would expect for a man in his position, but he noticed a small red stain on his forearm, and he saw me watching him as he went to clean it. “Cherries,” he said with a smile. “Lots of cherries. We got 50kg of really top quality cherries earlier, and I was helping the kitchen prepare them. 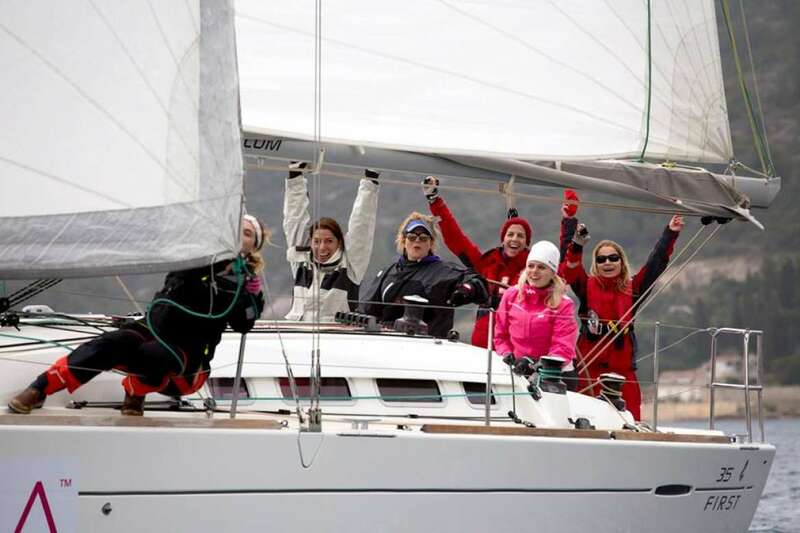 You will soon see.” A nice touch, I felt, an owner willing to chip in and help with the more menial chores. Don Dino gave me that impression. A family business, with a motivated workforce in love with their food and their jobs, a very relaxed atmosphere that made you feel like… home. And he was not wrong about the cherries, which played centre stage in the dessert finale. I had been warned about the Don Dino ice cream by friends before I came. Sensational. 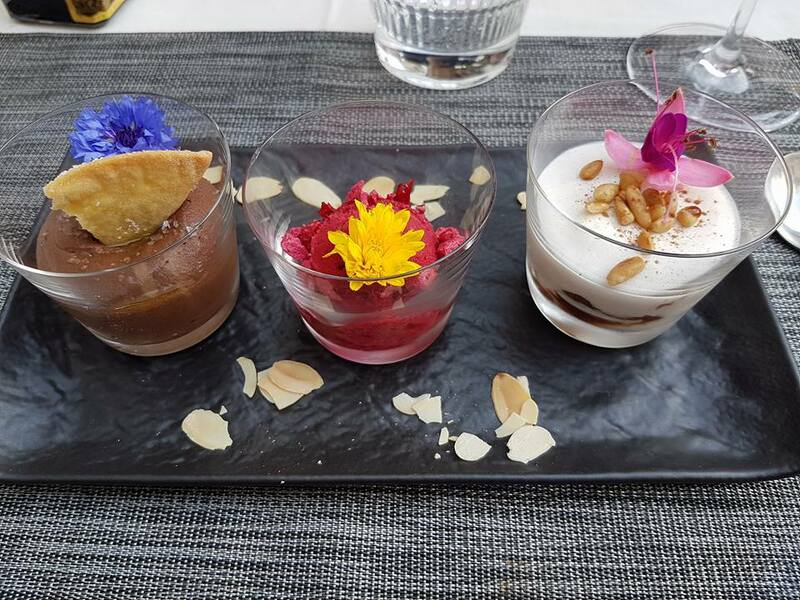 A fabulous three dessert finish, as delicious and diverse as it was colourful, to end one of the best meals I had had in a long time. A word on the wines, which again we left to our waiter, who served us by the glass, with a different wine for every course, after we had kicked off with the delighted sparkling Sember from Plesivica. It was an excellent tour of the reds, whites and roses of Croatia, taking in Istria, Dalmatia and continental Croatia, including of course the local favourite Crljenak Kastelanski (otherwise known as the original Zinfandel, after researchers at the University of Davis in California proved a 100% DNA match with Zinfandel. Yes, Zinfandel comes from just outside Trogir). But it was also nice to have a little international flavour to the mix, and I closed my eyes as I sipped my first Chablis Grand Cru in many, many years, my mind going back to my frequent trips to that magnificent French wine down during my frequent trips in a previous trip as a wine merchant. As for the famous Don Dino ice cream, some guests may skip dessert and look for an ice cream on the street. There is no need to do that, for right next to the restaurant is Don Dino, the Ice Cream Parlour, an additional level of class that the owners have brought to this historic location. Easily the number one rated restaurant on TripAdvisor for the town, it must have been a brave decision for the owners to move the restaurant to such an upscale level in a town not noted for its cuisine. And even braver move – and both ways – to bring in such a celebrated chef. 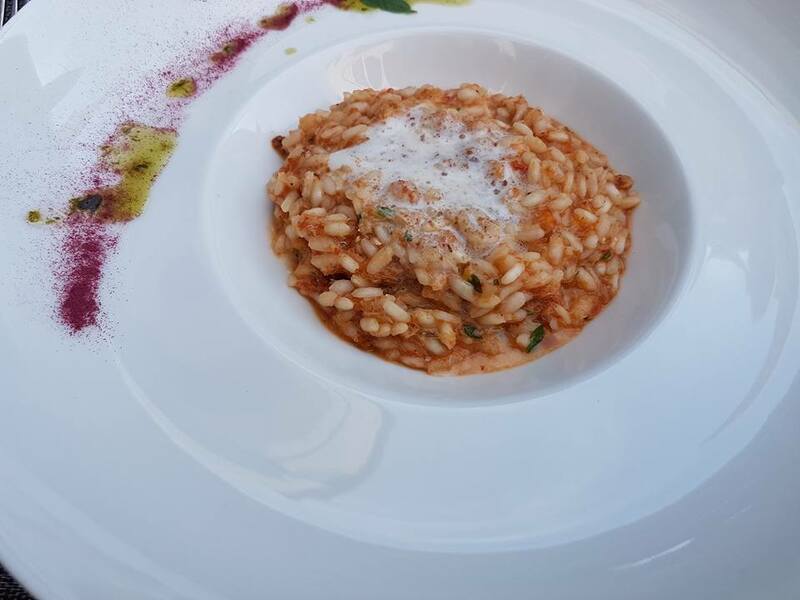 But the risk has more than paid off, and the Don Dino experience is a quality addition to the Dalmatian dining scene, and a very relaxed alternative to peak season Split and Dubrovnik, for example. Coming back to the small details again, I liked the fact that the restaurant has a policy of not accepting groups of more than six diners per table. The aim is to create a chilled ambience to enjoy fine dining in an atmosphere as relaxed as if you were at home. It works, and works really well. 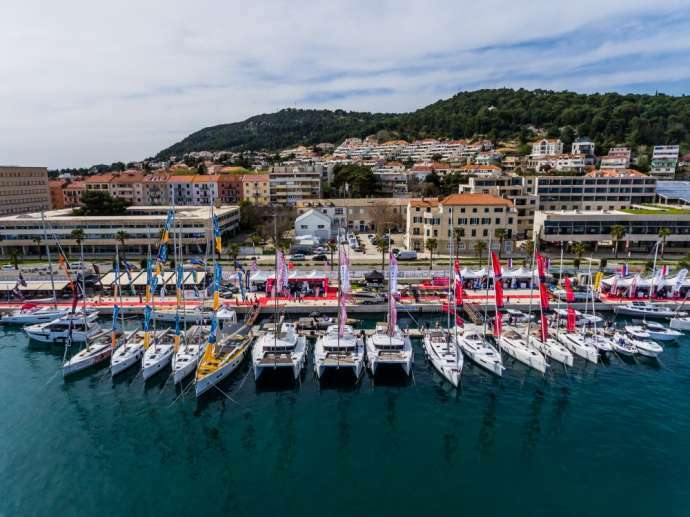 And I reflected, once again, on the sad reality that most of the best tourism initiatives in Croatia come from local businessmen with vision taking a risk and asserting their vision to improve a mediocre offer. 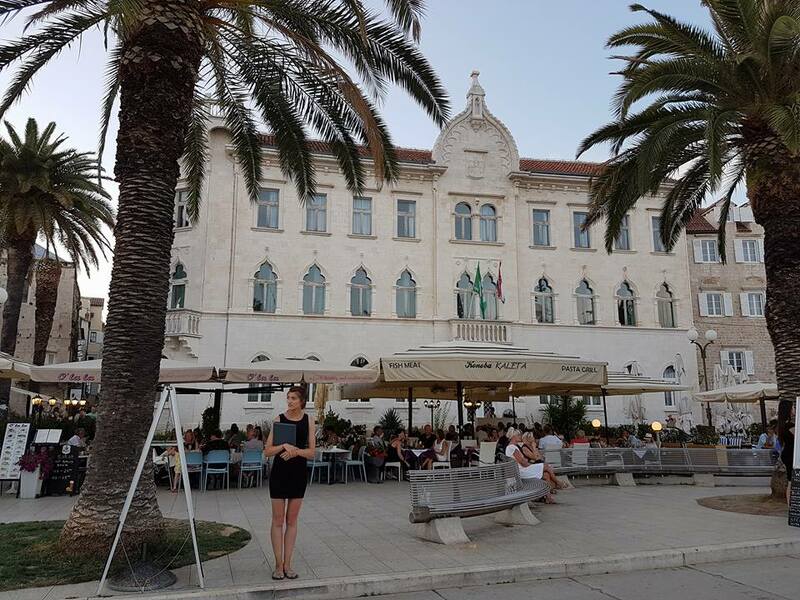 Sometimes a restaurant is just about the food, and while that was certainly the highlight of my visit, I couldn’t help thinking about the overall package of a trip to Trogir combined with dinner. 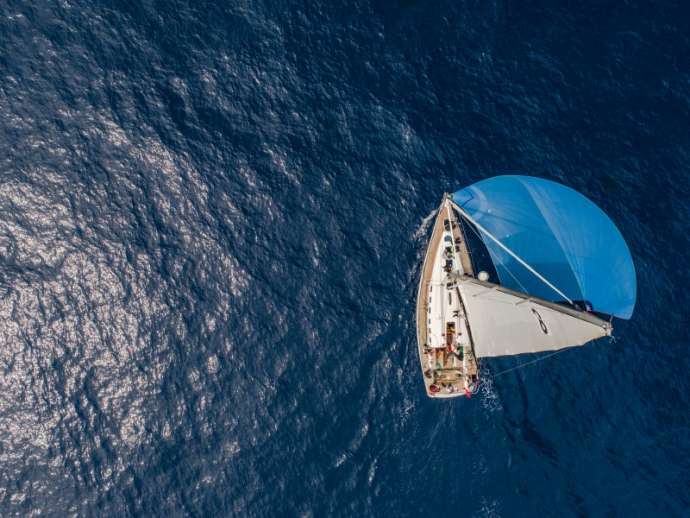 I visited in the second half of June, not quite peak season, but with Split already heaving, I was not sure what to expect. 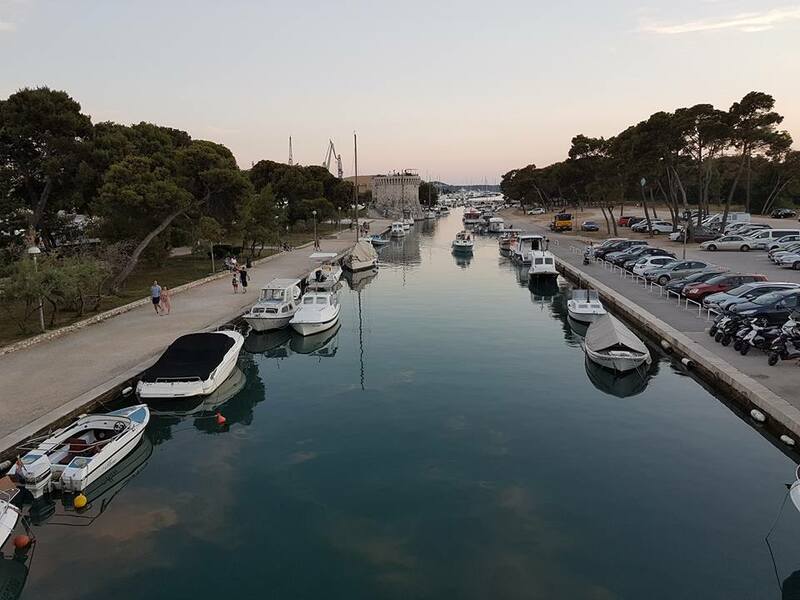 To my surprise and delight, I found Trogir to be much less crowded, its picturesque old town a warren of treasures at every turn, and the perfect accompaniment – both before and after – to a very fine meal. The canal, which is just metres from the restaurant, is about to undergo renovation, with a paved walkway and underwater lights, which will make it even prettier. The waterfront is a joy to experience, reminiscent to me of Hvar Town 15 years ago. Full of historic buildings and with just the right number of tourists. The old town itself is majestic, and it deserves a much better photographer than me to present it, so I direct you instead to one of the best official promo videos I have seen about a destination in Croatia. Take three minutes to watch it below. I am Don Dino. It was a spectacular dining experience which is with me still. 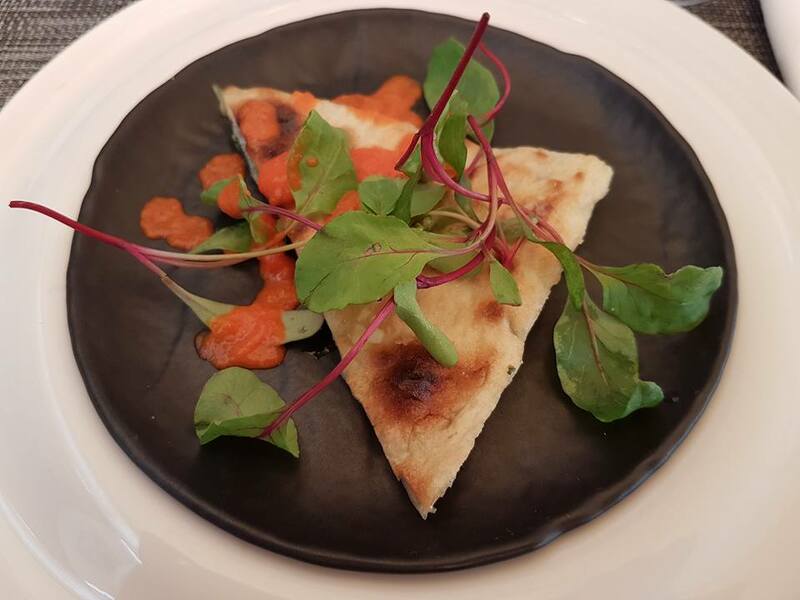 The food, the wine, the ambience – it was all of that and more – but I think it was that mixture of feeling at home and being able to enjoy some of the finest, and most innovative, Dalmatian cuisine (and yes, authentic, traditional, local ingredients) that is what stays with me still. It is rare that I feel such an urge to return to a restaurant, but with Don Dino, I am planning my time. I suggest you do too. For more information about Don Dino, and to reserve, visit the official website.